Vaccine Induced Shoulder Pain – Skyhar MD Inc. I have been treating shoulder problems as an orthopaedic surgeon for nearly 30 years. Every year around flu vaccine time I see several patients with the onset of shoulder pain that has a proximate relationship to a vaccine injection. The patients invariably deny any trauma or any other reason to explain the onset of the shoulder pain. The patients occasionally relate the onset of pain to the vaccine injection. This shoulder pain has been mentioned briefly in the literature and has been given the acronym “SIRVA”, or Shoulder Injury Related to Vaccine Administration. Speculation exists as to why this pain occurs. A patient shows up at a site that is approved to administer vaccinations. The patient is asked to expose their deltoid muscle area (muscle covering the side of the shoulder). After skin antisepsis, the needle is placed into the deltoid muscle and the vaccine liquid is injected. The vaccination is meant to be an intramuscular (inside the muscle) injection. Sounds simple, right? Depending upon the length of needle used, thickness of the deltoid muscle and depth of needle placement, the tip of the needle can pass completely through the deltoid muscle and the vaccine fluid can be injected deep to the muscle layer into the bursa sac. If this occurs the needle first enters the sub-acromial (shoulder) bursa sac as soon as it goes through the deltoid muscle. The next structure the needle hits is the humerus bone. This anatomy deep to the muscle is all very close together. If the needle passes all the way through the deltoid muscle and the syringe plunger is deployed, the vaccine fluid ends up in the bursa sac. The bursa is a very large (in terms of surface area) thin, water tight sac with a little fluid inside. It acts as a lubricator for the shoulder mechanism. The bursa exists on the top, front, back and side of the shoulder. On the side of the shoulder the bursa extends most of the way down the deltoid muscle. If the bursa sac gets irritation/inflammation for any reason, one then has “bursitis”. An unintentional injection of vaccine fluid (antigenic material) into the bursa will likely create an inflammatory reaction that basically is a “bursitis”. If the needle hits bone then the bone can react as well. This all translates into a patient with shoulder pain that usually goes away fairly soon with over the counter measures. However, at least half the time the pain persists and can worsen. This can lead to MD visits, X-rays, MRI scans, cortisone injections, need for prescription meds, physical therapy/Chiropractic and rarely surgery. Frozen shoulder can sometimes occur as a result of the pain syndrome. This scenario is more common in females in my experience. This is likely due to the fact that the female’s deltoid muscle is generally thinner than that of males. A thinner deltoid muscle would make inadvertent passage through the muscle more likely. 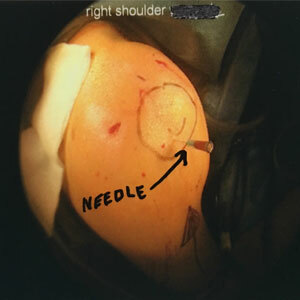 The two photos were taken in the operating room during arthroscopy of a right shoulder. The needle in the picture on the right is a 25 gauge one inch needle placed in a typical vaccination insertion location on the deltoid muscle. 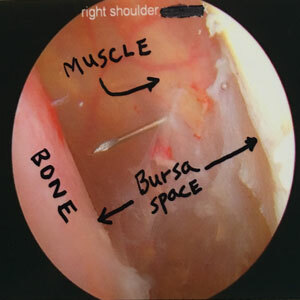 The needle was advanced through the muscle into the bursa while observing within the bursa sac with the scope. Interestingly there was no tactile sensation noted as a result of passing the needle through the muscle into the bursa. The photo on the left shows the needle in the bursa sac with muscle on the right and the humerus bone on the left. The bursa sac is distended with saline during arthroscopy, making the structures look farther apart. The native state of this anatomy would illustrate that the muscle would be very close to the bone with the bursa just being a thin two sided membrane inbetween. It would be easy to inadvertently inject vaccine fluid into the bursa as illustrated. This is ALL avoidable by simply asking that the vaccine be placed in a different location, such as the upper/outer buttocks. Dr. Skyhar is a board certified orthopaedic surgeon, in practice on the campus of Scripps Memorial Hospital, Encinitas since 1988. © 2016 Skyhar. All Rights Reserved.